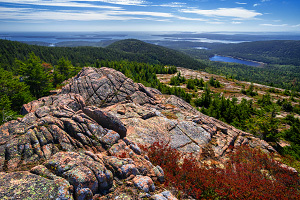 When you look at a map of the trails on Mount Desert Island, you may be overwhelmed by the hiking options and the criss-crossing trails, especially in the Middle Peaks area. Sargent Mountain alone has more than six different approaches to the summit. While there are many, many options for wandering hikes, one interesting idea is a loop hike up the lesser-travelled Hadlock Brook Trail to the summit of Sargent Mountain and then back down the nearby Maple Spring Trail. While this hike is a bit off the radar, it passes by several unique viewpoints as well as offering easy access to three of Acadia's majestic carriage-road bridges, including the famous Waterfall Bridge. The Hadlock Brook Trail continues up through the forested terrain crossing several forks of Hadlock Brook. 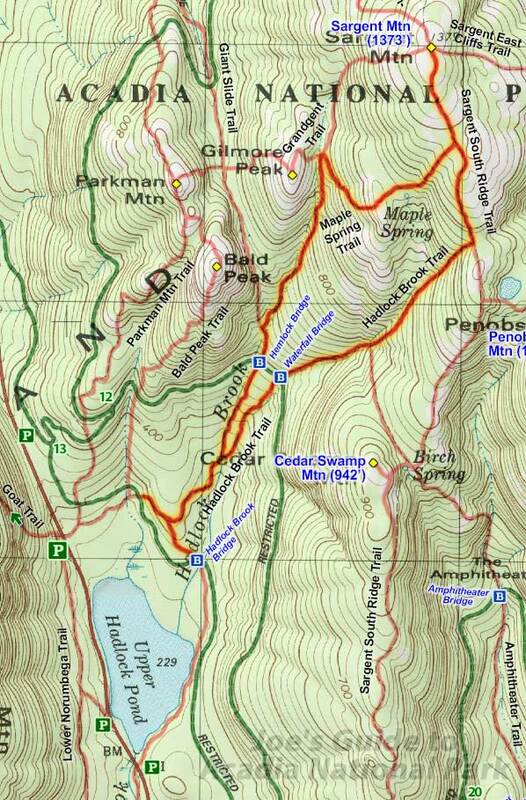 After roughly half a mile, the trail reaches Waterfall Bridge and the Around-Mountain Carriage Road. Completed in 1925, Waterfall Bridge is one of the more famous carriage-road bridges as its skewed arch perfectly frames the beautiful Hadlock Falls. 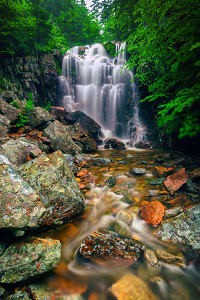 (While Acadia isn't really known for waterfalls, Hadlock Falls is one of the few majestic waterfalls on MDI, but it only runs at full force during the spring melt or after a good rainstorm.) From this spot, you can also visit Hemlock Bridge which is only a stone's throw west along the carriage road, although we'll hit this when we descend the Maple Spring Trail. Past Waterfall Bridge, the Hadlock Brook Trail gets a bit more strenuous as it continues its ascent up the forested slopes of Sargent Mountain. After the junction with the Amphitheater Trail and a final steep push, the trail clears the trees and you will be hiking on open granite to join up with the Sargent South Ridge Trail. Be sure to look behind you to take in the open vistas and continue another half a mile up to the summit of Sargent Mountain. There are many fun ways back down Sargent Mountain, and for this hike, we'll choose the Maple Spring Trail. From the summit, hike back down the Sargent South Ridge Trail for .3 miles and then turn right (west) onto the Maple Spring Trail. The trail makes a quick descent into a small forested oasis known as Maple Spring, then it ascends again to an open ridgeline with beautiful views and interesting glacier-carved lines in the rock; this is the golden spot of the hike! You can leave the trail for a bit to explore along the magnificent granite formations with views of both Hadlock Ponds to the south and Parkman, Bald, and Gilmore Peaks just to the east. Continuing down the trail, we return to the forest again and just past the junction with the Grandgent Trail, the Maple Spring Trail descends the gorge between Gilmore Peak and Sargent Mountain; the trail is pretty rugged in spots as it follows and crosses the small stream several times. Soon enough, we reach Hemlock Bridge, another one of the magnificent carriage-road bridges that was completed in 1924. The Maple Spring Trail continues south of the bridge and eventually leaves the stream to join up with the Hadlock Brook Trail. Continue to back to whichever parking lot you started at. 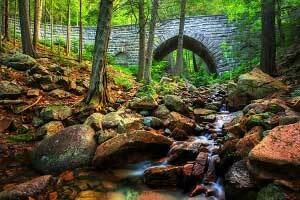 The Hadlock Brook Trail and the Maple Spring Trail might not be on the top of the list for casual tourists who are looking to hike the best of Acadia, but these trails offer a wonderful hiking experience with easy access to three carriage road bridges. And the view from the ridgeline just west of Maple Spring is a magical lesser-visited spot!